Have you ever been working on an important job only to have your office printer or color copier stop working? Of course this is something that every person who has worked in an office has experienced. 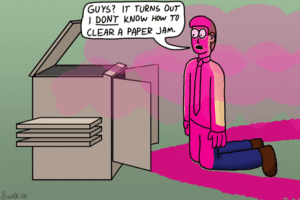 This is the all-too-common experience of having a paper jam. They are a pesky burden, but fixing a paper jam is a relatively painless process. Fixing a paper jam is nice because it’s something you can do without the help from your maintenance team. Remember to stay calm and follow directions. Being angry will lead to mistakes and randomly searching inside your machine is sure to cause problems. Follow these steps and your machine should be well on its way to working normally. Locate the source of the jam. This will usually be in the paper tray. If you are unable to find the source of the jam in the paper tray then you may need to open the copier. Gently remove the paper causing the jam. Make sure to not yank or pull aggressively on the paper. This can cause something to break inside the copier and only casue more problems. Remove any extra scraps. Double check for any small scraps that may be left behind. These could cause issues later. Run a cleaning program. This is not necessary but will help to remove tiny pieces of paper and dust from the brushes. If you follow these steps then you shouldn’t be experiencing any more issues. If you are still having problems then it may be time to call an expert to look at your machine before the problem gets worse.